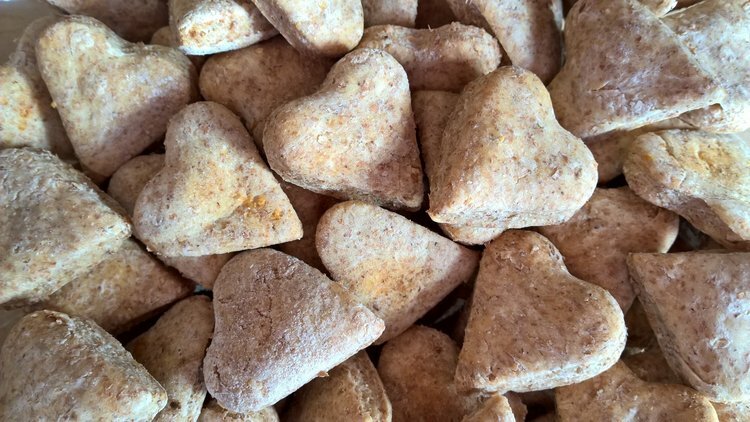 Doesn’t the special pooch in your life deserve a tasty gift, handmade with love, this Valentine’s Day? I don’t actually have a dog myself, but I wasn’t going to let a small detail like that stop me from making a batch of dog biscuits. I do of course know people who have dogs. Plus I’m happy to report my cats appear to like these biscuits too. – ½ cup hot chicken/meat broth (make a simple broth by simmering chicken or any meat bones for at least two hours, and then straining well. You can freeze the spare broth). 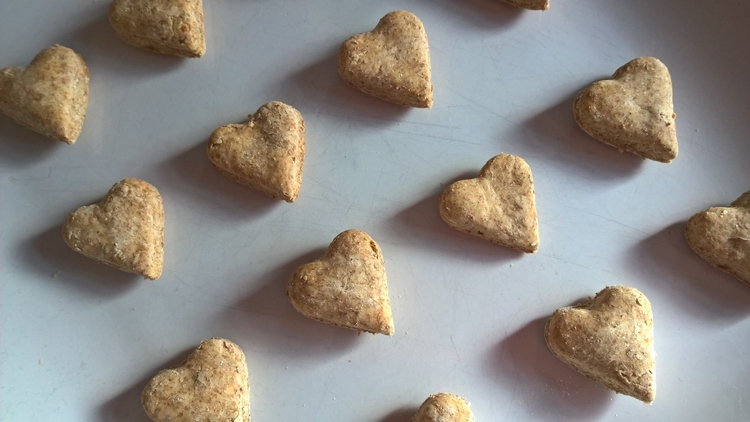 You could of course use a bouillon/stock cube or granules to make your broth instead, but really the main point of making homemade dog biscuits is to control what goes in them, if you buy cubes then you’re likely to get a lot of other stuff in them that your dog really doesn’t need. 1. Combine all the ingredients until they form a dough, add a little more broth if it’s too crumbly. Knead it for a couple of minutes on a lightly floured surface. 2. Roll it out until it’s about 1/2 inch thick. Cut out the biscuits using a small heart-shaped cutter, gather and re-roll as necessary. Place them on lightly greased baking sheets. 3. Bake in a preheated oven 160C/320F for about 30 minutes until they are crisp. 4. Cool on a rack and then store in an airtight container. I adapted this recipe from a dog biscuit recipe on Cesarsway. The original recipe used bouillon granules, I’ve explained why I didn’t want to do that. That recipe also added a teaspoon of salt. I really can’t see any reason at all to add salt. Surely dogs get all the salt they need from what naturally occurs in food? I’m certainly no dog expert, so happy to be told otherwise if there’s a good reason to add salt. Well, Happy Valentine’s Day to pets everywhere! 🙂 Hopefully that’s what dogs think too! Obviously you did not pick up the tone and non verbal aspect of my woofing. I was jumping up and drooling at the sight of said treats and begging madly. 🙂 Now do I get one? Sounds like a recipe Bob will like. I will hopefully get to make them Friday. Love your answer yes Bob is the dog on the blog, Pat is the husband. Maybe Pat would like some too. What a great idea for a gift for dog-owning friends and family. The biscuits would be so cute wrapped up in a cellophane bag with a Valentine’s Day bow. This is a fantastic idea. If I had more time, I’d love to surprise Max upstairs. Maybe another time. These are wonderful. I’d agree with you on the added salt, Vanessa. Sounds best to just leave it off. I always forget about bones from roasts and whatnot, too…this should help me remember. Yep, I try and do something for everyone here! 🙂 I love making chicken soup starting with the bones after a roast chicken, so I naturally always think of that. I used to make my own peanut butter dog treats. I even got a cookie cutter in the shape of a dog bone. They’re super easy to make, and you really do feel like a good dog owner! I also agree about the salt! Yes, the original recipe suggested cutting them into bone shapes, I obviously just did the heart shapes this time to celebrate the holiday! Yes, I really don’t get why they added salt! Yes, but I wish they hadn’t been quite so popular with you Neil, they’re for dogs! What a cute idea! My mom used to get our cats an cat-only ice cream treat at the store when I was a kid in the summer time, they went nuts for it!